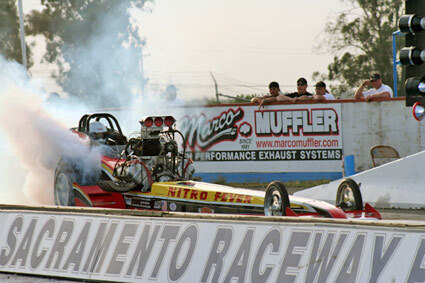 SACRAMENTO RACEWAY PARK - JUNE 9, 2007: For the second time in 3 weeks Jim Murphy and the WW2 Racing team ran the table at Sacramento Raceway by topping another stellar field of Nostalgia Top Fuel Dragsters. Despite air temps over 90 degrees and a track reaching 125 degrees Murphy was the only car in the fives and he did it all three runs. 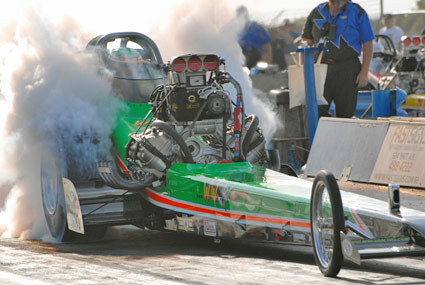 During the entertaining nitro show several teams tried to taunt the hot, tricky track with more power than it was willing to absorb at times: i.e., some where successful and some suffered. Murphy's 5.97 at 243 and 5.95 at 238 during qualifying were the benchmarks of the successful side. Summer in the Sacramento Valley can be hot and unforgiving, but on this particular weekend the daytime temperatures were balmy in comparison with last year's event. It was quite hot (over 90 degrees for the first two sessions, with a density altitude of near 3000') with track temps over 110. The show also included the AA/Gas Supercharged cars and they created a groove that had a definite left hook to it at about 330'. 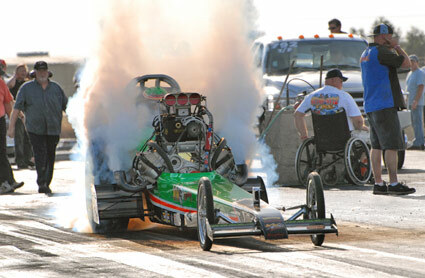 And, with a thin umbrella of wispy clouds filtering out some of the sun's heat, crew chiefs at the 2007 Nitro Nite of Fire had a little larger window in which to gamble when calculating their tune up. 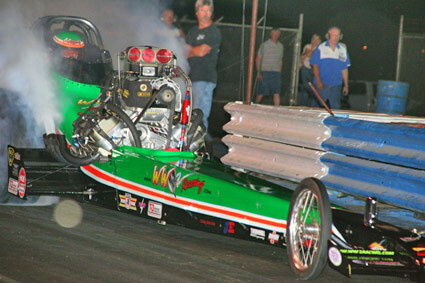 Ten top fuel dragsters entered the Chicago-style elimination show including Mike O'Brien's Mother's Worry outlaw fuel altered. At promptly 5:30 p.m. qualifying for the opportunity to race in the final got underway. 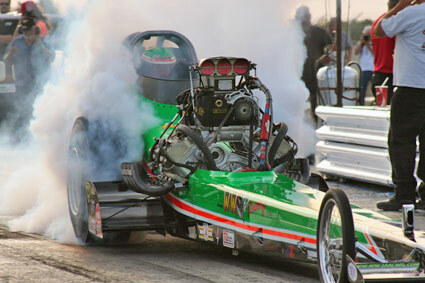 For the first session Jim Murphy in his "WW2 Racing" entry was paired with Jason Richey in Dave Smith's "Nitro Fever". 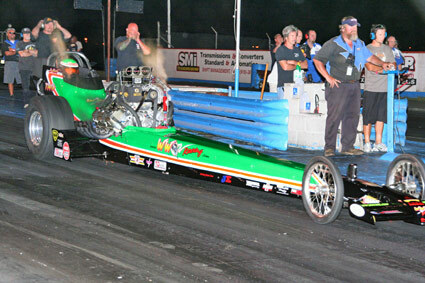 Murphy's 60' time of 1.054 was not his best, but his 4.003-196.69 to the 1/8 mile were tops for round one. 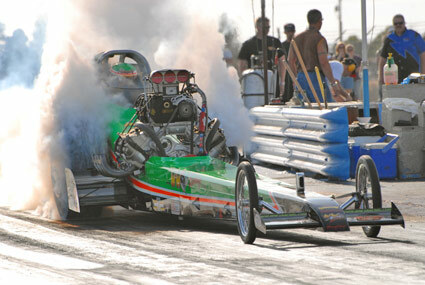 Murphy went to the head of the pack when he recorded the only 5-second run of round 1, a 5.976 at 243.66. Nitro Fever was a little phlegmatic at the start of the run, hazed the tires down track, and Richey made the best of a less than stellar run to clock a 6.325 at 207.34. Prior to session two, though the cloud formations were not massive, they repelled enough of the sun to keep conditions temperate for all in attendance; check out our Stars and Stripes - could have used a little breeze. Jim Murphy was paired in session two with Mike McClennan in Mike Fuller's car. 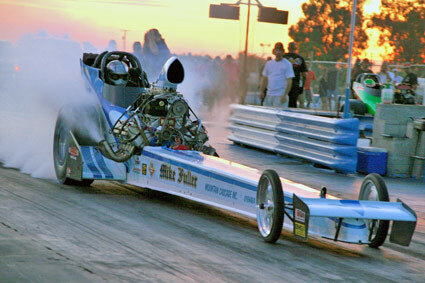 What could have been called "just a good old drag race" was little consolation to Mike Fuller and his team as they just missed out on a chance to race in the final round. Murphy, totally unfettered by having to run in the left lane, unleashed a 1.006 60' time and the car remained glued to the ground to record a stellar 5.951 at 238.09. 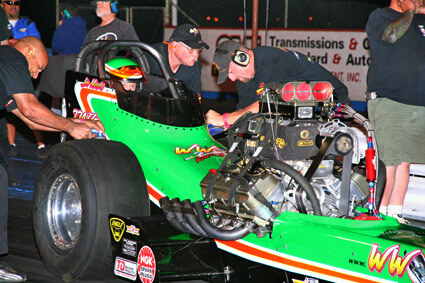 McLennan was close with a 6.049 at 245.58. So much for the theory that the left lane could not deliver some good times for the top fuel dragsters; King James was looking good for the final. By the time the final ran Saturday night the air and track had cooled to a tolerable level. 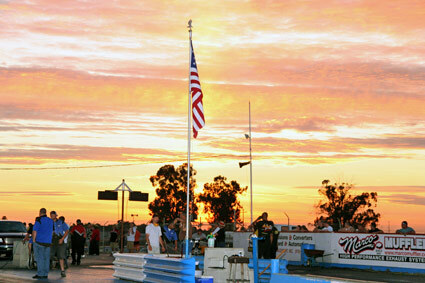 Murphy was paired with Rick White from San Diego who had previously run 6.00 at 242 and was not to be taken lightly. 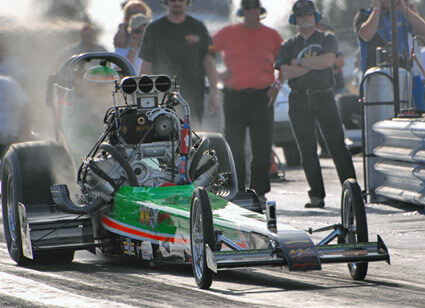 Jim and crew chief, Tim Beebe got the tune-up right on and White was never a factor as the green car ran a sterling 5.866 at 249.91 (low ET and top speed of the meet). The icing on the cake was their 60' time - a best ever 1.000. Murphy owes that in part to the new M&H tires which he "likes a lot". Murphy heats his tires for the final against White. The crew cleans the tires prior to Murphy staging. What a day for WW2 Racing: top time, low e.t. 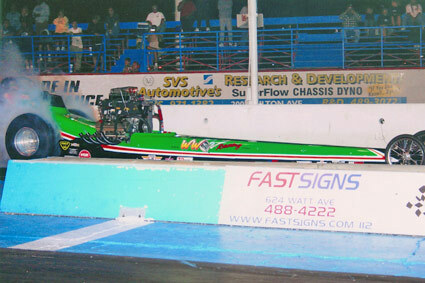 (including the three quickest times), and top eliminator. Jim Murphy and WW2 Racing is on a roll (should have won the March Meet) and definitely should be the favorite going into Boise.